In 1935, restaurant owner Gus Poulos created his first batch of homemade ice cream that was far richer and more satisfying than any other in that era, anywhere in Chicago. Word traveled fast about the quality of Homer's Ice Cream. Its humble beginnings as a two-table ice cream parlor did not last long. Soon people from all around, up and down Chicago's North Shore came to Homer's. 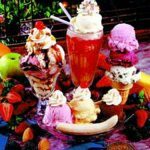 In fact, Homers Wilmette Restaurant and Ice Cream Parlor, located at 1237 Green Bay road in Wilmette, IL is the original location. We strive to create incredible homemade ice creams that taste as good as they look. We mix and match unusual combinations so that every scoop that we serve meets your highest ice cream expectations.